1. The fuse holder is placed adjacent to the battery which consists of specified fuse 7A and the spare fuse. Never use a fuse with a different rating from that specified. It may lead to serious damage to the electrical system or a fire due to short circuit. Battery gives of explosive gases. keep sparks, flames & cigarettes away. 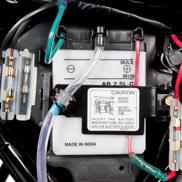 When checking battery electrolyte level or adding distilled water, make sure the breather tube is connected to the battery breather outlet. 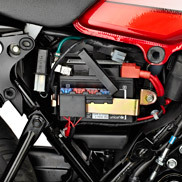 Do not attempt to start or drive the motorcycle without a charged battery, it can cause fusing of the bulbs and permanent damage to certain electrical components. Turn the ignition switch "OFF" before checking or replacing the fuse to prevent accidental short circuiting. 2. The fuse box is mounted on the battery clamp. Battery gives off explosive gases. Keep sparks, flames & cigarettes away. Do not attempt to start or ride the motorcycle without a charged battery, it can cause fusing of the bulbs and permanent damage to certain electrical components. Turn the ignition switch "OFF" before checking or replacing the fuse to prevent accidental short-circuiting.